Almost always made with pork and imbued with strong herby flavors, particularly fennel, Italian sausages can be cooked in a variety of ways. For sandwiches, where a little snap in the casing is desirable, frying brings out the best. For sausage and sauce combinations, a slow simmer or bake concentrates the flavors. Italian sausages can be fried in extra-virgin olive oil for about 12 minutes until brown, but the process rarely ends there. Unlike German sausages, which tend to be paired with mustard only, Italian sausages express their full character in conjunction with other ingredients. Onions and sweet red peppers are a tried and tested combination for a sandwich. Because the sausage is little more than ground pork shoulder and herbs, the casing can also be removed and the meat broken down in the skillet, ready for simmering with garlic in a marinara sauce. Alternatively, fry the sausage meat with a half-cup of red wine. 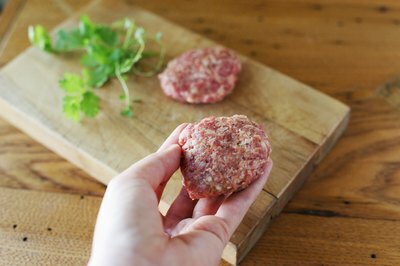 For a more intense flavor, marinate the sausage meat first with herbs, for up to 2 hours in the refrigerator; arrange into patties; and fry for roughly 10 minutes, flipping to cook on each side. Italian sausages are ripe for grilling, but the heat needs to be indirect and subtle. Lay them directly over the coals and the casing will char and burst, while the inside is still raw. Position them in too cool a spot, by contrast, and the casing will wrinkle with no browning. Instead, cook the sausages close to the charcoal but not above it. If cooking with peppers for the classic sandwich, place the tray of peppers on a rack below the sausages, if possible, so that any fats and juices collect in the tray. Grill the sausages covered for 15 to 20 minutes, basting the sausages with balsamic vinegar and honey toward the end for a shimmering glaze. The internal temperature should be 145 degrees Fahrenheit. While pink meat can still be safe in pork chops or loin, it is not a good sign in ground pork. Allow the sausages to go above 155 F, however, and the casings are liable to burst, squirting hot liquid. 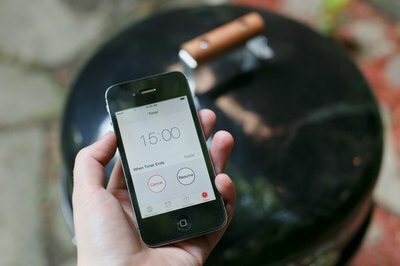 Boiling is not suitable for fatty, coarse Italian sausages, and will leach out the flavors without contributing any tangible benefit. Poaching the sausages for a few minutes in water or wine, however, can prepare the meat for the harsh heat of a broiler. For sturdier flavors, poach the sausages for 4 to 5 minutes with onions and dark beer, but pat the skin dry before transferring to the broiler. Otherwise, the sausages can go directly beneath the broiler, about 3 to 5 inches from the heat. Prick the sausage casing first with a fork to allow the juices to flow and cook for 10 to 12 minutes, turning them occasionally for even browning. The advantage of broiling rather than grilling is there is no risk of flare-ups and scorching. Once the skin has started to crackle and crisp, remove the sausages, let them rest and serve with mustard, for example. 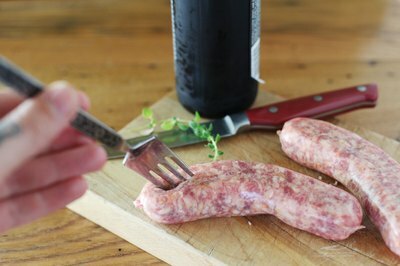 Baking Italian sausage pays homage to the fact that fine-grade pork cuts and fresh herbs make it into the casing, rather than the budget medley of off-cuts and fillers of many supermarket-brand links. Fry the sausages first in a skillet for around 8 minutes to brown the skin, then bake in the oven uncovered at 400 F for around 25 minutes. Rest the sausages on a bed of sautéed mushrooms, onions and peppers, for example, and baste the sausages occasionally with the sweet, buttery liquid that collects. 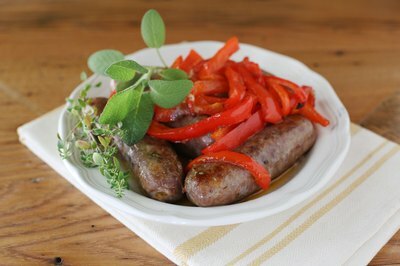 Sausages can also be baked by themselves, tossed in oil and sprinkled with thyme and oregano.